Amps with 15″ speakers used to be a big deal. Now, nobody seems to want them. Whyizzit that Stevie Ray liked these (64 Vibroverb) so much? As of June 27th of this year, I have had a brick and mortar store (OK, it’s a wooden train car) for two years. In that time, perhaps a dozen cool guitars have walked in the door that I’ve bought. It’s one of the best reasons to have an actual store. Nobody has walked in with a ‘burst that’s been under a bed since Grandpa died in 1978 but there have been some very nice guitars. But not as many as I would have expected. That might be because guitars are pretty easy to sell and pretty easy to ship. But amps? Not so much. In that same time frame, I’ve had at least 35 amps walk in the door and I’ve bought (or taken as consignments) nearly all of them. 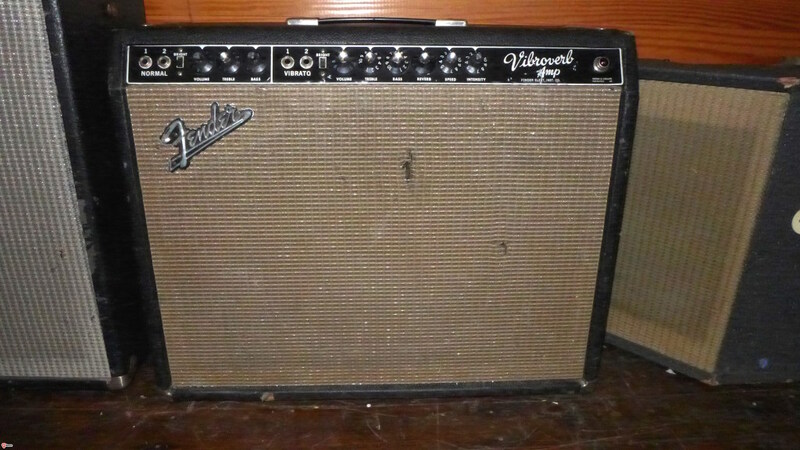 It’s very hard to resist great old amps. Interestingly and not surprisingly, most have been Fenders and all of them have been tube amps. After all, that’s what most of us used back in the day. Yeah, we had our little flings with solid state. I had a Vox Royal Guardsman for a while when I was a teenager and later, when I was gigging regularly, I had an Acoustic Control amp (solid state) which was a pretty great amp but I think the speakers had something to do with that. 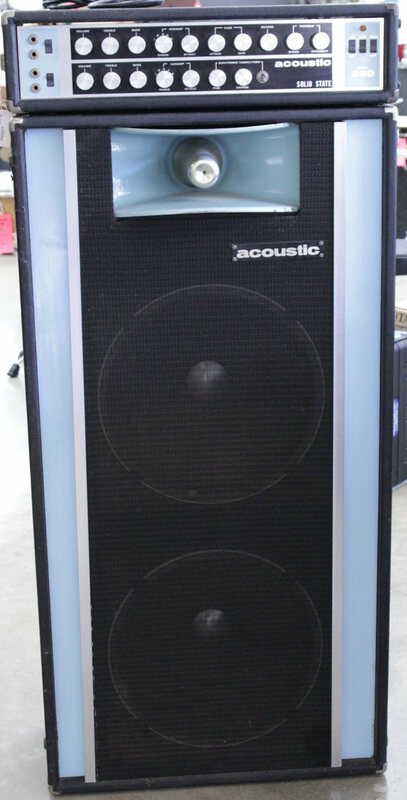 My Acoustic amp had 2-15″ JBL’s and a horn the size of a Buick. It weighed about 1000 lbs. That brings me to the point of this post. I remember seeing The Doors in the late 60’s and decided I had to have one of these amps. Pretty good for solid state but I think the speakers may have had something to do with it. Recently I wrote about how well multiple 10″ speakers seem to pair with 335’s. 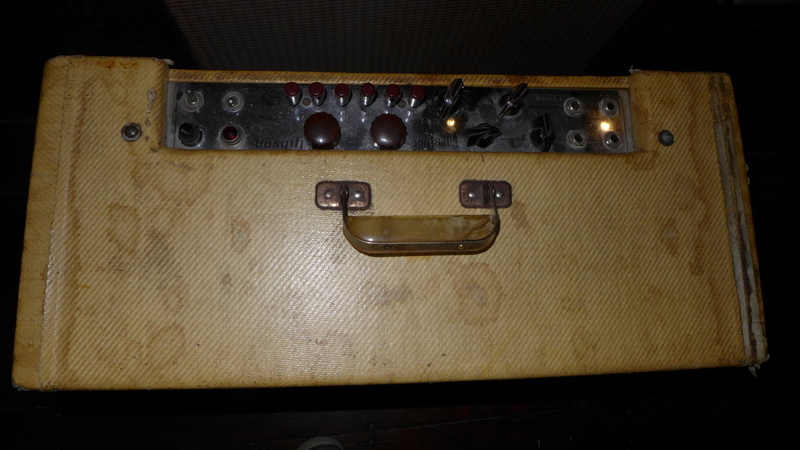 Cases in point being a 3-10 tweed Bandmaster, a couple of 4-10 Bassmans, a BF Tremolux and a silver face Vibrolux all of which I had in my shop at the time. At the same time, I had no amps with 15″ speakers. 15’s just seem to be out of fashion and that seems odd considering just how popular they have been in the past. I had a 64 Showman with a 15″ JBL that I used all through high school and the aforementioned Acoustic with the 15’s that I used through college and after. There was a period in the late 90’s when I had a pretty wonderful 63 BF Pro with a single 15. Then years went by without any 15″ speaker amps at all. Decades really. Then, in the past couple of weeks, a bunch of amps with 15’s came in and I gave them another listen. Once you get used to a bit of mud in your neck pickup at high volume, you barely notice it. That is, until you play the same guitar through a 15. The bottom seems to clean right up to the point where the bottom strings take on a truly musical tone instead of a dullish thud. I have three 15″ amps right now, each with it’s own signature tone. The blackface Vibroverb is a long time favorite with massive clean tones in all pickup positions right up to “8” on the dial. The wide panel tweed Pro breaks up like a tweed at fairly low volume but the bass notes don’t get totally lost in the dirt like they can on a tweed Deluxe or even a Super or Bandmaster. Finally, there’s a Gibson GA-80 “Varitone” with its five preset tones, 25 watts and a 15″ speaker. Interesting amp. Probably be great for country as it shows a lot of highs and honk. The presets depend on various value capacitors which act as notch filters and give the guitar a range of tones from scooped mids to out of phase Strat honk straight up twang. Cool amp that is as rare as it is unusual. So don’t just dismiss amps with a single 15 as archaic or out of vogue. 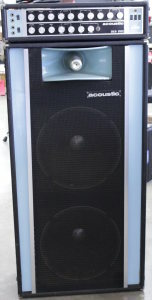 I think the big Marshall cabinets of the 60’s and 70’s probably killed the 15″ speaker as much as anything but nowadays folks want to carry less and still get big tone. maybe it’s time to take a look backward and see just why these were all the rage back in 67. This is a Gibson GA-80 “Varitone”. Lots of buttons to play with and a big fat 15″ Jensen. 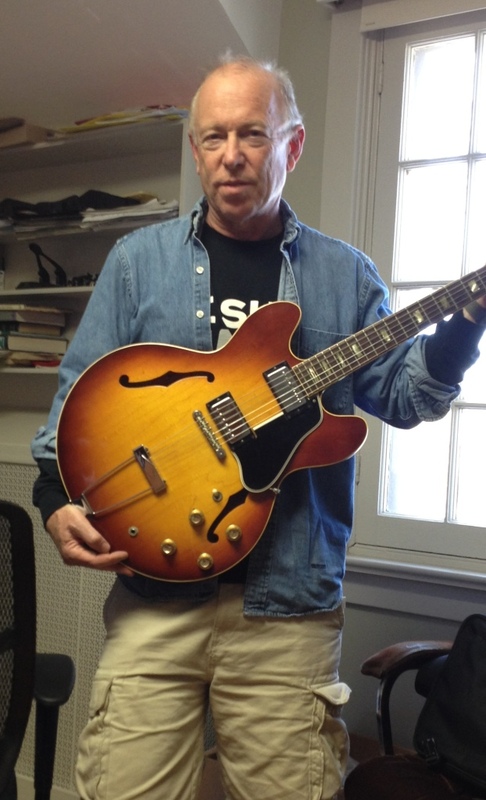 Not everyone can afford a 58-64 ES-335. $15000-$45000 is an awful lot of money for a guitar (even if you’ll probably get it back when you sell it). When I get asked for advice from buyers with $5000-$7000 to spend, I usually steer them toward 345’s and 355’s with issues from the same era. But if a 335 is the only choice for you, then 65 to 69 models are worth considering. Most of you already know why the values drop precipitously from 64 to 65 but I’ll give you the short version in case you missed that day. In 65, the stop tailpiece was discontinued and replaced with a trapeze. But that isn’t the big reason. By mid ’65 the nut width has shrunk from 1 11/16″ to 1 5/8″ to 1 9/16″. It doesn’t seem like much but wrap your hand around that narrow neck and you will definitely notice the difference. There were other changes, like nickel hardware being switched for chrome and changes to the pickups (from enamel coat windings to poly coat) that took place in 65. But the neck size is the main reason you can pay $15000 or more for a 64 and $5000 for a late 65. We’ll toss out the big neck 65’s from the discussion because they generally are priced at around $8000-$9000. Less than a 64 but beyond that $5000-$7000 range that is such a popular range. So, we have late 65, 66, 67, 68 and 69 to look at. I would toss out late 69 because the “Norlin” changes (neck volute, short neck tenon) should cost even less. They aren’t terrible guitars but 65-early 69 are generally better. Nobody likes the volute and the shorter tenon can have stability issues (although most don’t). One of the common assumptions is that all of these guitars have t-tops except maybe a few early 65’s. That’s simply not true. I’ve seen pre T-tops as late as 69 and I’ve never, repeat, never, seen a t-top in 65 and rarely in 66. In fact most 67’s don’t have t-tops either. 68 is a toss up but plenty of them have pre t-tops. T-tops can be great pickups as well, so, stop worrying about the pickups. There are vast differences in the neck profiles during this period and that might help you decide. The problem is that they are kind of all over the place. I find most 65’s to have fairly large necks but 66’s generally have really, really thin necks. They go from a bit larger to way larger in 67 but some are still pretty thin. By 68 and into 69, they can get very large. I have a 69 (OK, it’s a 340) that has a huge (but narrow) neck profile. It rivals many 59’s. It’s not just the profile that merits a look-65’s and some 66’s get you a Brazilian board while 67 and later gets you Indian rosewood. One the point to make-a very popular vintage guitar information site states that 68’s have a wide nut. They don’t. Period. Don’t ignore the small stuff either. 65 and 66 have the wide bevel pick guard which I think is a lot more attractive. 68 and 69 have big f-holes which look a bit cartoonish to my eye. 65 and most 66’s have reflector knobs while late 66 to 69 have witch hat knobs which I really don’t like but knobs are easy to change. They certainly don’t affect tone or playability nor do other little details like the position of the headstock “Crown” inlay. It’s higher in 65-66 and lower in 67-69. They also changed the inlay material at some point in 67 (I think). The inlays are whiter and don’t have the same tendency to dry out and curl up at the edges. For my $5000-$7000, I’d go with a 65. Narrow but medium chunky neck profile, Brazilian rosewood for sure, big bevel guard and maybe some nickel hardware. A big problem is that so many sellers describe their 66-69 335’s as 65’s. The reason for this is because the serial numbers were re-used as many as four times over these years. It never surprises me that these sellers simply look at the serial number charts and pick the earliest possible year. Do your homework. Look at the features. It’s pretty easy to tell a wide bevel guard from a narrow bevel. It’s easy to tell a low “crown” inlay from a high one. It’s not that hard to tell the big f-holes from the small ones. Read my old posts-I’ve covered all of this before and then go out there and find the “one”. Wanna blonde without paying huge bucks? 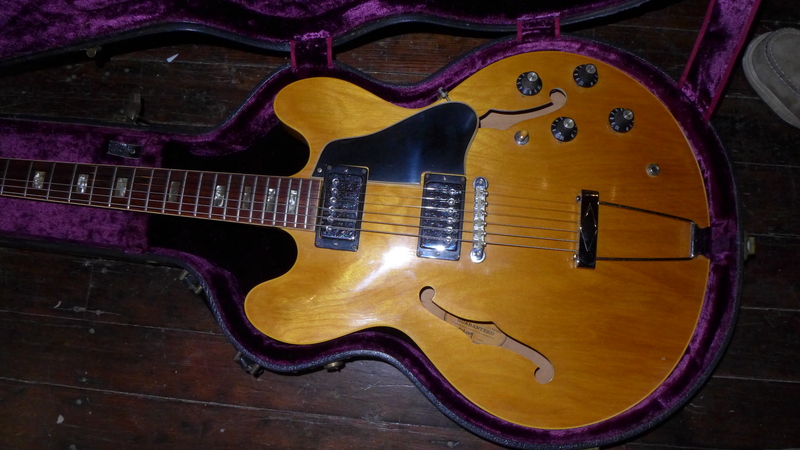 Buy a 69 ES-340 and rewire it as a 335. You can find these in the under $5000 range. 70 and later are less money but they’ll have the neck volute which everybody hates. You might even get pre T-tops. This one has them.